Walsall striker Tom Bradshaw has been called up by Wales for their forthcoming friendly with the Netherlands - to end his two-year absence from international football. Wales Under-21 boss Geraint Williams said he would no longer consider him for selection following a club versus country selection row in 2013. But that stance has softened now the 23-year-old is in Wales' senior ranks. His call-up means Walsall must postpone the game at Shrewsbury on 14 November. Shrewsbury-born Bradshaw, who has scored 29 goals in 56 appearances for the Saddlers since leaving Shropshire for the Black Country in June 2014, was due to return to his hometown club. But that has had to be postponed because of his selection by Chris Coleman for the 23-man Wales squad to face the Dutch the night before at the Cardiff City Stadium. Walsall have now had three players called up for international duty - the minimum number required to request a postponement. Fellow front line operator Romaine Sawyers has been picked by St Kitts & Nevis, while goalkeeper Neil Etheridge is a regular for the Philippines. 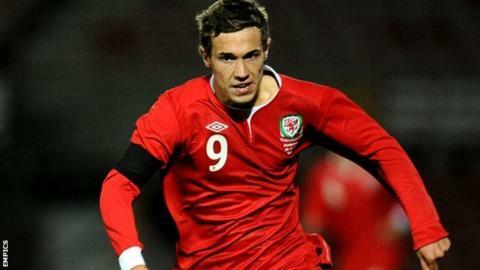 Bradshaw's international career stalled while he was still at Shrewsbury, when he was called up for Wales' Under-21 Championship matches against Lithuania and San Marino. Shrewsbury withdrew him to play in a League One game against Gillingham in October 2013, but it has since been smoothed over. He was called up by Wales a year ago when he was put on standby for the Euro 2016 qualifiers against Bosnia-Hercegovina and Cyprus, only to pick up a hamstring injury. But he has remained on the standby list since and has now been named by Coleman, at a time when he has scored just once for the Saddlers in seven games - and that was a penalty. He joins a squad missing its star turns Gareth Bale and the injured Aaron Ramsey, but already warming up for next summer's Euro 2016 finals in France. Sawyers, Walsall's second top scorer with six goals this season, will be part of the St Kitts & Nevis team for friendlies against Andorra on 12 November and Estonia on 17 November. And Etheridge faces a trip Manila to play for the Philippines against Yemen in a fixture that is a qualifier both for the 2018 World Cup and the 2019 Asia Cup.